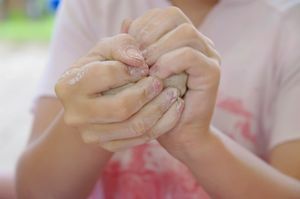 This list of Play-Doh activities is meant for use in the junior high or high school classroom, and will employ kinesthetic activities while still checking for understanding and reinforcing the learning taking place. I have found that students (yes, even high school students!) jump at the chance to use Play-Doh in the classroom. They love the throwback to their childhoods as well as getting to use their hands. If you don’t know how to get enough Play-Doh, at the beginning of the year I put it as an optional item (on my syllabus) for students to bring in. They are so excited about it that many of them bring in more than one tub! Also, it’s important to note that Create is at the top of Bloom’s Taxonomy. When students are forced to synthesize what they’ve learned and make a sculpture, they are doing some crazy critical thinking. Play-Doh is a great way to keep students engaged, let them use their hands, employ creativity, and you can have a new and different form of assessment that is actually fun. Did I just say fun in the same sentence with assessment? Mind = blown. Many of these activities were originally used in a Language Arts and/or World Studies (co-curricular English and World History) classroom, but can definitely be used in any subject classroom with reading assignments, vocabulary needing to be learned, and reflection on topics that require student assessment. Feel free to use all the ideas listed below, but if you’d like the handouts, click this link: https://www.teacherspayteachers.com/Store/Teachupsidedown. Play-Doh Vocabulary Matching Game (handout) – The teacher directs the students to 10 vocabulary words he/she would like them to learn and/or reflect on. From those words, students can either be assigned or choose their own word to write a sentence in context and create a sculpture that best reflects that word. Students write their words and definitions or sentences on paper and play a “matching game” with other students from the class, matching the correct word to the sculpture. A great formative assessment or review game. Kinesthetic Brain Engagement (handout) – One of the common assessments used by English teachers is a Socratic Seminar. One type of Socratic Seminar is called the “Fish Bowl”, when one group of students is in the center having discussion and the rest of the students are listening and taking notes. Often I’ve noticed the outside circle of students is not engaged in the class discussion. A great way to use Play-Doh is to ask students to create a sculpture related to the discussion and explain how & why that sculpture applies to the class discussion OR class lecture. Process Play-Doh – Have students use Play-Doh to artistically represent a process. Timeline Play-Doh (handout) – Have students create a timeline (or this handout could also be used for the process) by placing a small Play-Doh sculpture in each of the five boxes on the handout. It is always good to have students explain their sculptures to someone else in a reflective activity. Reconstruction – Students can reconstruct a location from a certain time period or a setting from a story. They can use clues from the text to make the construction. This can be used in most subjects with an emphasis on text evidence. Model – In Science classes, students can create models of cells, etc. In History, students can create models of inventions or historical objects of importance. In English, models can be made of the writing process or symbols used in writing. In math class, students can make models of a story problem, or even create a graph out of Play-Doh just to give them the opportunity to look at things differently than the way they usually do. Gallery Walk (handout) – With any of the activities you do with Play-Doh, it is always great to have students do a gallery walk. You can use the critical thinking questions on the handout attached, or you can come up with your own. Game of Bowling – Students create bowling pins and bowling balls from Play-Doh. Develop a list of questions based on how many “pins” a student knocks down. Sculptionary Review Game – Based on the game Pictionary, make slips of paper with vocab or terminology on them. Place the students in teams or partnerships and have them draw the term. They have 30 seconds – 1 minute (you choose) to create that sculpture and see if the other students on their team can guess. For Kinesthetic Students – For kids who have trouble sitting still (your tappers, clickers, and noise makers), make play-doh an option. Obviously set rules for how and when they can use it, but if you need someone to keep their hands busy, make Play-Doh available whenever they need it. At the beginning of the year, I always have my students take a learning styles quiz so I know who is kinesthetic (more and more every year). YOU create the sculpture! (handout) – Why should the kids have all the fun? Make a sculpture or sculptures for a bell-ringer. Have the students identify what the sculpture is and how it is related to yesterday’s class or last night’s reading. Mapping – If you are using a map for any reason, Play-Doh is a great way to “emphasize” certain locations by adding little sculptures that identify what happened in that particular location or what important event happened there. This can be used in foreign language classes, History courses, and even ecological studies. Living Comic Strip (handout) – Students can take parts of a story, chapter, and/or section and create a living comic strip complete with dialogue bubbles and captions. You can copy the handout as many times as needed. Students will probably prefer to make their own comic strip so it fits their own comic. Show and Tell (handout) – When students come back from a break, instead of having them share what they did over the break, have them sculpt it. A great back to school activity.